Gregory was plumbing in the new boiler when he dropped a bombshell. “Bollywood came to Samos and I was an extra” he casually mentioned as if this wasn’t one of the biggest events in the island’s history since Pythagoras. He grinned down at me from the ladder. “Miss India had a leading role as well” he added for good measure. I was suitably impressed and, of course, needed more information. Bollywood had indeed come to Samos and had been filming for a thriller called “The Game” (provisional title). Crew, directors, actors, a bevy of beautiful dancing girls and enough Indian food to feed an army had arrived enmasse and taken up residence in one of the hotels. Their chefs took over the kitchens and proceeded to cook copious amounts of food for the cast, crew and incidentals. Residents of the island were recruited to be extras, boom holders, drivers, tourist guides and odd job men. Gregorie was paid 200 Euros a day to become a gangster. “They asked me to shave my hair off but I refused” he said “then they offered me 400 Euros if I would reconsider, but I still said no”. He stroked his hair thoughtfully. “Why not” I asked, thinking that for 400 Euros a days I’d shave everything off – especially if I lived on Samos and had to earn a living there. “I’d planned to go to Mykonos…………..and the girls, well you know” he replied with a bashful smile and shrug of the shoulders. “Guess which one takes expensive holidays, has a large mansion in the country and sends their children to private schools” he asked. Still, despite refusing to cut his locks one thing that Gregorie didn’t say no to was the food that their chefs produced. Now this is unusual because many Greeks are quite conservative and tend to stick to traditional food. When I first came to the island and cast around for ways to make a living there I thought about opening a Thai or Indian restaurant but was advised by many friends that the residents would not eat the food. 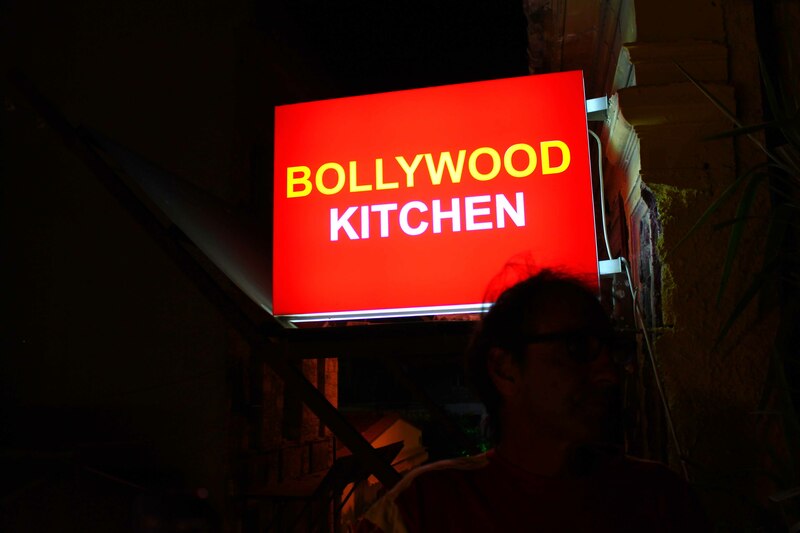 So I was nicely surprised when we stayed in Athens to find the Bollywood Kitchen, good food, amazing view of the Parthenon from the roof top eating area ( especially at night), decent wine and good service. Who knows maybe some of those chefs decided to stay. Hopefully one of them will take up residence in Samos! I love how you tied the threads of your narrative together. I did not expect to end at the Acropolis in Athens.